Graeme is the proprietor of Chocky Sweet Box, and tells his story of how he expanded from a $30 start up capital to a nationally distributed chocolate and sweets producer. Warning: there are references to wombat poo which may be offensive to some people ;-). It is a great pleasure and privilege to be here recognizing Elaine as a Paul Harris fellow. A Paul Harris award is given to someone who has contributed to the club and local community as well as, recognizing their effort and dedication towards the humanitarian and educational causes of Rotary. 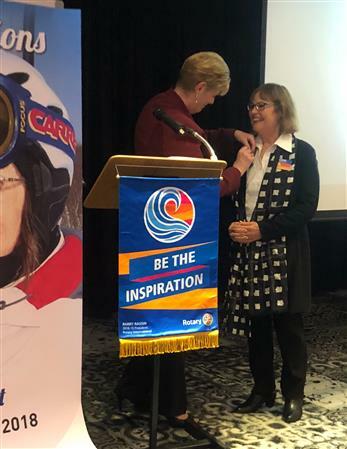 Elaine was an original member when the club started in 2002, and then chartered in March 2003.
enthusiasm and completed efficiently and with a great attention to detail.